There’s no doubt that Marvel is running on all cylinders. The Avengers set a new precedent for what was expected from the franchise, and since then, Phase 2 of the Marvel Cinematic Universe has delivered on all fronts. Two of the strongest Marvel movies, Iron Man 3 and Captain America: The Winter Soldier, have been released through Phase 2, and now, arguably its greatest effort has been unveiled. From the get-go, Guardians of the Galaxy brings us into its vast universe of intricate CGI. The way it builds its world (or worlds) is truly fascinating. Every painstaking detail translates on screen and you find yourself securely immersed in this ravaged section of celestial magic. Everything feels and looks real, though it’s obviously not. Here’s a movie that can easily be another great-looking, self-serious addition to the gritty side of superhero films set in space. Yet, it’s not. Not even a little bit. The thing that makes Guardians of the Galaxy so wonderful is that it’s completely bonkers! There’s no way to make a serious film with a sentient tree that can only tell you its name. (“I am Groot”). The producers know it, and best of all, James Gunn knows it. So, it’s pretty obvious that James Gunn was given a lot to play with and for that, I am truly thankful. He took the term “sci-fi epic” and turned it on its head. Chris Pratt leads the cast of misfits quite ably. I had my reservations about Chris Pratt as a leading man, though he had been showing some range recently, but he performs marvelously as the 70’s music-loving rogue, Peter Quill (or “Star Lord” as he likes to be called.) Under the employment of Yondu (“The Walking Dead’s” Michael Rooker) Quill is a treasure hunter who finds a mysterious orb with little expectation of what’s about to transpire. See, this orb contains a power that Ronan the Accuser (Lee Pace) and his, let’s say, immense, boss are very much interested in acquiring. Ronan is hellbent on universal destruction, as a comic book villain is wont to do. And this orb is definitely going to make that a goal that’s a bit easier to attain. 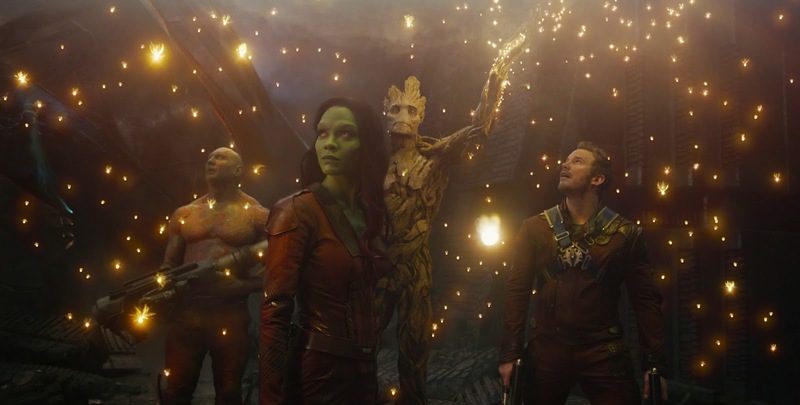 Thus begins an epic space adventure that sees Quill team up with Thanos’ orphaned daughter Gamora (Zoe Saldana), a scorned alien prisoner who doesn’t understand metaphors named Drax (played incredibly by Dave Bautista), and the tandem of Rocket (a genetically engineered talking raccoon indistinguishably voiced by Bradley Cooper) and Groot (adorable in a very deadly way and voiced by Vin Diesel), who end up stealing the show. Together, they form the unlikely team of the Guardians of the Galaxy. Their mission: stop the orb from getting into the wrong hands, and possibly make money off of it in the process. Hey, what more do you expect from a group that formed together in prison? From then on, bombastic action sequences explode on screen, segmented by the best scenes in the movie: the interactions between the newly united crew. From trying to figure out whether they’re forming a plan or a “concept” of a plan to Quill trying to use his womanizing charms on Gamora, there’s so much fun and excitement that the two hours just melt away. In all, it’s a movie that, much like its phenomenal soundtrack, borrows a lot of elements from similar genre films of the 70’s and 80’s. You definitely get the feel of Han Solo when you see Chris Pratt doing his thing on screen, and the futurescape we get from the film is tangentially retro. And I’m very serious about the soundtrack. It’s so good, I’m listening to it while I write this review. A lot of the commendation needs to fall on James Gunn. This is his first big-budget effort, and he didn’t have to sacrifice his wit or sharpness to make a labor of love. He was able to present a film that pieced together elements of testosterone, geekiness, nostalgia, sweetness, drama, and loads of comedy almost flawlessly. This movie had success written all over it thanks to his determined vision and strong cast of characters. There’s a reason such an obscure comic was greenlit for a sequel before it was determined if it would be successful. And I, for one, cannot wait until the inevitable crossover with the Avengers. Guardians of the Galaxy is not your typical superhero film, and it doesn’t pretend to be something it’s not. You’re gonna feel two things coming out of this movie: a childlike excitement for a sci-fi action movie, and discomfort in your pain-stricken face from uproarious laughter. More fun comic book films please!